The Secret Weapon of every dental office is their practice management software. The big secret is how it is used or underutilized. There are many good systems available to the dental community but most dentists only use a fraction of their utilities capabilities. Looking toward the future, dentists must embrace the power and versatility of their practice management suite. The benefits of a robust PMS can help them become more efficient and even more profitable. Whether you are a solo practitioner or a large group, practice efficiency and seamless technology integration is the goal! If you assess the business acumen of independent solo dental practices across the USA you will find these four business styles. These styles address leadership, management style and degree of confidence. There is a direct correlation between leadership type and operational efficiency as well as PMS competency and offices that track their key production numbers. Don’t need or want to know. The business is doing well and the owner has a nice level of financial freedom. The practice has outperformed their goals. This business is plagued by poor cash flow, lots of cancellations or a lack of team harmony. Historically, these practices underperform both clinically and operationally. In most cases, this is a leadership and training phenomenon. This is the belief that external forces such as insurance, regulatory and economic conditions determine your fate. This is when people fail to take personal responsibility and don’t believe in marketing, training or the power of a well-trained team. These offices do what’s necessary to own their future. They are focused and confident. They believe in themselves and are well trained and motivated. They know their key performance numbers and are determined to meet their goals. We are at a unique moment in time. There are many external challenges for the independent dentist. A dental facility is burdened with the need to acquire, implement and integrate new technology. Failure to do so, will result in a competitive disadvantage and will hurt them over time. Practice personnel must become more proficient in their duties. They should consider certification programs which will lead to expanded duties and ultimately, better execution. When a practice executes, they have a higher % of case acceptance and more elective activity. As PPO dentistry becomes more prevalent, practice owners will look for ways to grow profits and improve cash flow. This will accelerate the movement towards implant, preventive and same day dentistry! Most offices strive to run an efficient and state of the art dental facility. It is a daunting task for businesses to comply with the regulatory mandates and HR challenges while integrating technology and maintaining a compelling brand (story). Dentists should investigate Dentrix Profitability Coaching. Historically, offices that invest in this coaching increase cash flow and efficiencies, have less stress and provide better patient care. It is the secret weapon against the dilution of knowledge and its inexpensive (see diagram below). Whether you invest in profitability coaching or hire a local, certified Dentrix trainer you will benefit. In my sixteen years as a consultant, I have never heard of buyer’s remorse when clients invest in their administrative team. For more information on profitability coaching or to get a list of local trainers call 1-800- DENTRIX. Personal computing has changed the way we shop, do research and communicate. Smart phones are omnipresent and they are mobile. We can connect to anything, anywhere and anytime. We are immersed in an application revolution which will continue to impact us both professionally and personally. Expect to see a great deal of activity (mergers and acquisitions) in the technology sector. Many small companies and individual entrepreneurs are developing unique applications (mobile ready) that make life, work and managing tasks simpler. We will see the large tech firms secure their dominance in tech sectors that no one ever imagined, through acquisition. Hence the recent Microsoft and LinkedIn deal. Someone with great passion and entrepreneurial spirit was bound to develop a practice management software community. Below is an interview with Dayna Johnson. She is one of America’s most recognized Dentrix Practice Management Software training authorities. Dayna has just launched Novonee.com which is a member-based online dental community that gives Dentrix® users access to critical information and winning strategies. Novonee.com is the first digital community of its kind and I am confident that offices who subscribe will grow and prosper. EDB: Why do so many offices still use paper patient charts? Is there a deadline for offices to become chart-less/paperless? DJ: The mandate for the dental practice to transition from their paper charts to a digital chart is state by state, there is no federal mandate as of this interview. In talking with dentists and dental practice owners the number one reason holding them back from going paperless is the financial investment. This investment includes not only the infrastructure and hardware but the training involved for the team to implement the transition. It takes planning, setup and implementation for a successful transition to a paperless environment. This is why I developed my Path to Paperless coaching program about 8 years ago. EDB: Is there a significant difference in practice management software capabilities regarding insurance submittal (Capitation, PPO and Medicaid)? DJ: Since I only work with Dentrix practices I can only assume that the other practice management software have the capability of handling all types of insurance submission. The setup in the practice management software is key to making sure the claim is paid within 30 days. The practice must also work with a reputable clearinghouse that is able to send electronic claims, attachments and provide the practice with tracking status. There are several options for sending electronic claims, however not all of them provide these must haves for proper claim tracking. EDB: Do you expect more offices to store treatment plans in their software in the future? Please elaborate on the benefits off doing this. DJ: In my experience about 60-80% of offices are already entering the treatment plan into the software. The practice might still be using a paper chart and entering the treatment plan into the computer so they can provide the patient with a written out of pocket estimate. There are several benefits for entering the treatment plan into the practice management software including, creating statistical data on your case acceptance so you don’t have to track it manually which saves a ton of time. Also, being able to pull a report directly from the software so the team can call patients who have unscheduled treatment helps keep the schedule full and the practice profitable. I call this “mining for gold”. EDB: Can you explain why it’s so important for a dental office to close out the day, month or year? DJ: Yes, absolutely. The most important reason is security and protecting the integrity of the data. There is a lot of data, PHI and statistical information that the owner of the practice has a responsibility to protect. If the team does not close out or lock up the data then it becomes vulnerable to theft, data loss or unauthorized clinical documentation changes which could result in the doctors license being at risk. I hear of office managers or even doctors leaving the “books open” because it is easier to change things, however this is a huge risk and is not recommended. Closing out the month performs many housekeeping duties such as; resetting the patient’s dental insurance maximum, aging the account balances and moving the ending accounts receivable balance to the beginning balance of the new month. DJ: The answer is the most widely “unused” Dentrix business reports are the most powerful. I don’t know if the doctors don’t know about these reports or that they just don’t make the time to look at them. We have to remember that numbers tell a story and it is critical that the practice owner or administrative team member is watching the health of the practice. Here are my favorite reports and why I like them . . . Practice Advisor – This report is a monthly report and has a lot of statistical information which can be a bit overwhelming. If I was to pick 5 things on this report to look at that would be a great start. Production per day – every office should be scheduling to a production goal and sometimes we get caught up in the total monthly production instead of drilling it down. Accounts Receivable Ratio – this is a calculation between your accounts receivable and production. You will want to determine what is healthy for your practice and make sure you watch this number. New Patient Referral Sources – every new patient heard about you from somewhere or someone. This information helps with your marketing efforts and thank you’s to your referring patients. Patient Retention – this is one of the most important statistics you should be looking at. How big is the back door? How many of your patients are leaving the practice without you even knowing it. Patients pre-scheduling their next visit – the more patients pre-schedule their hygiene visit the less work your team must do to keep the schedule full. Daily Huddle Report – This report should be used during your morning huddle. It keeps the team on track for the month and will help you forecast if the production is lower than expected. Day sheet – This really should go without saying, but I see too often procedures being billing incorrectly or missed and collections not matching up to the bank account. This report is a must. EDB: Can a software program help you identify embezzlement? Are their reports a dentist can run to detect fraud? DJ: The practice management software should be the first line of defense against embezzlement because it is not emotional, reports are black and white. There are several reports that the doctor or practice owner can review on a daily, weekly, monthly or quarterly basis to look for red flags. Another piece that can be implemented in the practice management software is the use of unique passwords with specific security rights depending on the team member’s role in the practice. What I see in the dental practice more often than not is no one wants to be bothered with having to enter a password so it never gets implemented. Passwords and reviewing the proper reports could deter and potentially catch a thief. EDB: One of the best ways to grow a hygiene/perio department is to chart periodontal pocket depths. What are your thoughts regarding Voice recognition software for Perio charting and dictation? DJ: I love it! The software I am most familiar with is Voice Pro and it was built by Microsoft so it is a quality product. This technology helps the hygienist work independently so it can save salary expense and since it is easy to use the hygienist is more apt to use it instead of waiting for an assistant or rescheduling to the next visit. I remember training an office with this type of technology several years ago and the practice was an open concept building with no walls between operatories. I have to admit I was a little nervous, but it performed beautifully. There was no interference and Voice Pro never skipped a beat. The most important thing I have learned using this software is learning the commands, you cannot have a conversation with it. EDB: When do you think Cloud based PMS will compete with the likes of Dentrix? What do you think about Dentrix Ascend™? DJ: I love Dentrix Ascend! What I see with Dentrix Ascend is another option for the dental practice, especially if they have multiple locations. Since it is cloud based the doctor, practice owner and/or accountant have access to the data at anytime from anywhere. This is a really nice advantage over a server based software. EDB: Do you have a favorite patient reactivation/confirmation reminder software? DJ: There are so many choices out there right now. Most of them provide similar features. My best advice is to learn all the features and take advantage of the ones that resonate with you. What I find, is most practices sign up for the service, set it up with the support person and then put it on auto-pilot. These 3rd party software vendors don’t just send out reminder emails and text messages, they can provide treatment campaigns, ask for reviews, ask for referrals and even send out e- newsletters. Learn the software and manage its capabilities. Don’t jump ship and change all the time. Make sure your front office team is staying engaged with the software and staying connected to the dashboard and statistics. Make it a patient engagement tool not just a reminder system. You are building relationships here not just confirming appointments. EDB: What is the #1 weakness regarding administrative personnel and the PMS? DJ: The “because that is how we have always done it” syndrome. It is an epidemic in the software industry and creates stagnate, unproductive teams. Software and technology are constantly evolving and improving and so must the people who use is. The lack of professional training and useful resources is what feeds this unproductive environment. I learn something every day and the dental practice must tap into the learning aids available if they want to thrive and be successful. EDB: What motivated you to develop an online community like Novonee? DJ: I have been a certified Dentrix trainer for over 10 years and my client base has spread to a global business. Most dental teams use the software for basic processes and if they have a question, they call support. But what about the team that wants to optimize the software, increase their productivity (use more of the features of the software) and save time by learning to operate more efficiently? When I give a seminar, offices ask questions, learn from each other and network. I wanted to bring all of these learning resources and networking options to Dentrix users around the world. I wanted to bring Dentrix teams together under one roof where we could hold a live, interactive user meeting. The users could ask the “why” questions and get answers from people who use the software in the dental practice every day. I wanted Dentrix users to be able to network with each other and reach out to another office in their state or dental specialty and talk about issues that relate to them. I wanted to give the Dentrix users an organized forum where they can post questions and answers. My goal is to help create Dentrix super users. EDB: How will Novonee support the Dentrix trainer community? DJ: I love my trainer colleagues and that is why I invited them to be part of the community. Novonee is a great resource for the Dentrix office because it fills a void in resources now. 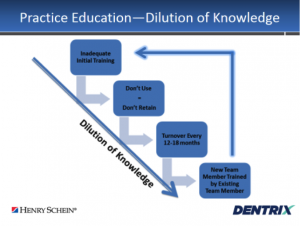 Not all dental team members have the ability to travel to a Dentrix user meeting and not all states are providing Dentrix user meetings so there is a huge need to learn information that they don’t even know exists. I vision Novonee members reaching out for in-office training for their team because of a tip they learn during one of the user meetings. With the trainers being members of Novonee, the office can message the trainer directly instead of scheduling through a 3rd party system. We can learn so much from each other and I wanted to create a safe environment where we can post up a question and receive quality information. 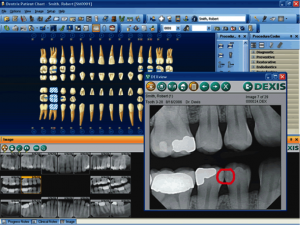 There are so many ways to get creative with the software to make it perform better and why not explore those ideas together and create a community of Dentrix super users.